Isn't this a pretty little ornament? Considering how quickly the days until Christmas are flying by, I bet you'll be happy to hear the directions to make one are surprisingly simple. Becky from North Carolina introduced me to the German bell via the Yahoo Quillers group several years ago... but relax, zero quilling is involved. She suggested using a 5 x 8 inch index card (system card in Australia) because the cardstock weight is just right. So that's what I used and have to agree... once the bell is finished, no one will ever guess it started as an index card that's cut down in size to a 5 inch square. After the bell was folded, loop inserted, and top point glued, I applied two coats of antique gold acrylic paint to the surface by dabbing it on with a stubby stencil brush. This gave the cardstock a slight texture... dare I even say an aged patina? For something different this year, I thought it would be fun to make bells with some pretty snowflake vellum I had on hand.... it's heavyweight, so is quite stiff. I'm happy to report it folded really well and I love how the translucence of the vellum allows light to shine through. Think how pretty these would be on a real Christmas tree... ahem, mine isn't up yet, not even close! Step 1 Cut a 5 x 5 inch square. Fold square in half. Step 2 Open square, turn paper ninety degrees and fold in half again. Step 3 Open square and fold two corners point to point. Step 4 Open square and fold remaining two corners point to point. Step 5 Open square and make an airplane fold at each corner. Do this by bringing paper on each side of fold line to midline and creasing. Make sure to open each airplane fold after you have creased the two sides before going on to airplane fold the next corner. Step 7 Cup the paper in the palm of one hand and gently press in on the center with the fingers of your other hand... this will convince the bell to take shape. If you have successfully completed all of the folds, the four points will spring up and you'll be holding a bell! Step 8 Make a hanging loop of ornament cording (cut about 10 inches) and knot the end after stringing on a bead or beads. Make another knot at the top of the beads so they won't slide off the loop. Step 9 Apply narrow strips of double-stick tape to the inside of the bell along each of the airplane folds. Adhere the tail of the hanging loop to one of the pieces of tape. Gently press the outside of the bell... the tape pieces will stick to one another, holding the bell closed. Step 10 Add a dab of quick-drying glue just inside the tip to make sure the bell won't pop open. Tip: I find it's best to use tape along the airplane folds as extra security when working with vellum, but if you are using an index card or cardstock, a bit of glue where the four corner points come together will most likely be all the adhesion that's needed. If you'd like to see the actual making of a bell, there's a great little video here. Watch Cindy Landecker fold one in an impromptu demonstration at a Stampin' Up! convention. Variation: Cindy adds an eyelet at the bottom of her bell and runs a ribbon loop through the middle and out the top, leaving extra ribbon at the bottom onto which she ties on a bead or medallion. Wow! I've been wondering how these were made ever since you showed them a few days back. Not hard at all! And so pretty and elegant. Thanks for the how-to! Very classy! They look like expensive ones from the store. So pretty and your instructions are great, very easy to follow. Thanks everyone - happy folding! Thanks so much! I was just looking for a tutorial just like this! I'm so happy to find such great detailed (and with photos! )instructions for this! Several years ago at an Advent workshop we made these with old Christmas cards. I've been saving old cards for a couple of years...now I can turn them into ornaments. Thank you! I have ben looking for this pattern! I made them every year since I was 14 years old for about 30+ years. I made them every year for my daughter's classmates & for the students in my classroom when I was teaching. I would use colored paper, 11in x 8in and cut it to 8in x 8in. I would put treats and maybe a little toy inside. I used thread to hold the tip together (so they could be opened easily) and added an ornament hook to put on the tree. I ws trying to come up with something to do for my co-workers. These will be perfect. 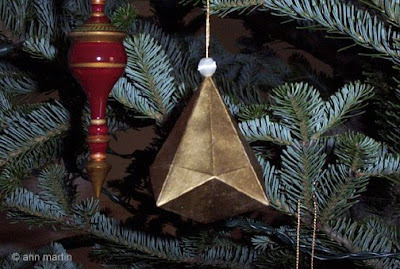 Thank you for posting this (for me) yearly traditional ornament. Thanks everyone! I'm delighted to hear that the tutorial has been like coming across an old friend for some of you. I was in the 2nd grade when an art teacher showed us how to make these. Im 42 now and I continue to make them. In fact, I just made one for my office. Thanks Elisa - much appreciated! Merry Christmas to you too. More than 40 years ago, when I was a little lad, we visited my grandparents for Christmas like we always did. The neighbors who lived in the house behind were a ritual visit to bring good cheer. One Christmas they decided that a tree was too difficult and expensive to put up. As a young child I was appalled that someone could not have a Christmas tree. I must have made enough of a fuss to my Mom because I remember that we got a small Christmas tree and the entire family spent the afternoon creating hand made decorations for the tree. Strung popcorn, stars, and the like. My father taught us all how to make these bells. It is a skill I have long since forgotten and he passed away a couple of years ago. I have been searching for a while for these instructions. I'm going to make a bunch of smaller sized bells and add them as gift wrap decorations to my families gifts this next Christmas to remind them of the day we spent making these. I cannot thank you enough. I miss my dad. Hi Norm, I'm happy to have helped. Thanks for taking the time to share your lovely story. Nice article, thanks. I just signed up to your blog rss feed. So excited to make these and the German stars!! Thanks for the fantastic instructions. I was just wondering if it's possible to make these and have them turn out well using regular, lightweight origami paper(?). Mary, yes, it's worth a try. I think it's possible, especially if you work with a light touch so the paper doesn't get wrinkled. Thank you so much! My Grandfather made some of these when I was a little girl. He gave me a few after my children were born. I have one left. I had learned how to make in grade school, but through the years forgot how. My Grandfather had given some to me after my children were born, and I only have one left. Did not want to take this sentimental item apart to figure it out, sooo this is great! My Grandfather used the front of used x-mas cards. So now I will be having fun making some for next Christmas. I'm glad you came across the directions - enjoy! What, I don't get how to get it to its shape, how do you do that?? It has 2 of the sides the same sides, but not the same as the other 2 sides. Anon, all four sides should be the same. Perhaps if you watch the video that will help. Sometimes it's easier if you can see something actually being made. so easy and a beautiful idea... do we know the story behind , the German bell ? Katy, so sorry for this late reply. I don't know of a story behind German bells. I'm glad you found your way here. Enjoy making the bell lanterns! ann...how interesting to read the comments of your readers and how popular these bells have been in the past. i am going to give them a go this year to hang together on my pink and mint green christmas tree. Thanks for posting this! I need to try this! Thank you for posting this. 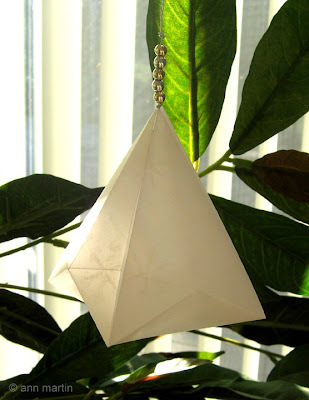 When my brother and I were young (early 80s) we used to make these for our Christmas tree. Unfortunately, May 2001, our barn where everything was stored burnt down and we lost all of that. Now I can make some for my Mama, myself, and my brother. I'm glad you found your way here, Jamie - happy making! I'm happy to hear you enjoyed making them. Thanks for your comment. Thank you! Mrs. Thomas, my second grade teacher taught us how to make these to decorate the class Christmas tree. We spent the entire month studying Christmas traditions around the world. These bells have never been forgotten, but how to make them was. Over the years I've wasted much paper and time trying to recall from the depths of my memory how to make them. You have relieved 40 yrs of struggle and stress. Hi Sheri, I'm so glad you found your way here and I hope you'll enjoy making the bells again after all these years. Your comment made my day! These have been known to me since my childhood in the 60s. They were featured in the December issue of one of the women's magazines. Also, if you make two the same size in contrasting papers, you can face them into each other and make a drum shape! Thanks for the information! I'll have to hold two together to understand what you mean about a drum shape... sounds intriguing.